The Oyster Bar at Harrah’s offers oysters galore and much more. Try one of four different types of oysters, clams on the half shell, shrimp and crab cakes. 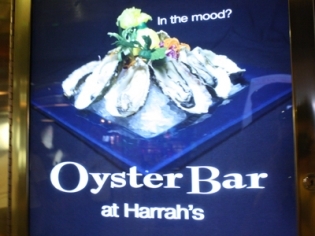 The Oyster Bar at Harrah’s offers oysters galore and much more. Try one of four different types of oysters, clams on the half shell, shrimp and crab cakes. The extensive seafood menu features selections for all varieties of appetites and the exemplary service gives an added bonus to an excellent dining experience. The seafood is flown in daily and you can watch the preparation from the casual raised seating in the 360 bar area. Entrees range from pasta to steak to the fresh catch of the day. This Oyster Bar may be landlocked but it will rival any on the coast! Very good oysters. Raw and rockereller! Will definitely come again! Some of the best clam chowder we have had anywhere.